Jim Wilkerson is a Missouri Communist Party USA activist. 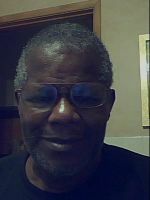 Jim Wilkerson progressed through the NAACP, CORE, St. Louis Black Labor Council and the Coalition of Black Trade Unionists into the ranks of the Communist Party USA. I joined the St. Louis NAACP youth chapter, and in 1965, I joined CORE and participated in the struggle for equal employment at the Jefferson Bank. In 1966, I joined Local 513R of the railway workers union. Fighting racism through the trade union movement, I joined the St. Louis Black Labor Council and began to read left books: Marx's Capital and Foner's Organized Labor and the Black Worker. I began to understand the nature of class division and the role racism plays. The BLC became one of seven founding chapters of the Coalition of Black Trade Unionists in 1972. I joined the CPUSA that same year. It was the Party's principled stance against racism that attracted me. I've seen first-hand how corporate greed uses divisions within the working class to gain more profits. St. Louis Coalition of Black Trade Unionists chapter trustee Jim Wilkerson, attended CBTU’s founding convention with Lew Moye in the early 1970s. The Communist Party USA paper People's Weekly World issued a statement to mark Labor Day 1995, entitled "We honor the dead and fight like hell for the living." Of the more than 100 endorsers listed, almost all were identified members of the Communist Party USA. Jim Wilkerson, Op Engineers Local 513, St Louis Missouri, was on the list. In December 1995 the Communist Party USA newspaper Peoples Weekly World published a page of 75th birthday greetings to William (Red) Davis - "Lifelong working class fighter and Communist"
In the fight for the unity and integrity of the Party in St. Louis, Missouri, in the post-war years, "Red" has been a rock of confidence and commitment to building the Communist Party. Greetings were sent from Jim Wilkerson of Missouri. The Communist Party USA's Peoples Weekly World 1997 May Day Supplement listed several St. Louis Friends of the Peoples Weekly World. they were Lew Moye, Melanie Shouse, Jay Ozier, Zenobia Thompson, E. E. W. Clay, Luther Mitchell, Susan Davis, Jim Wilkerson, John Pappademos, Nafisa Kabir, William (Red) Davis. 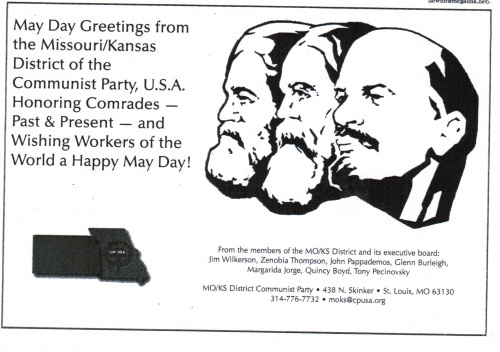 In September 2006 the Peoples Weekly Worldlisted several members and friends of the Missouri/Kansas Communist Party USA. 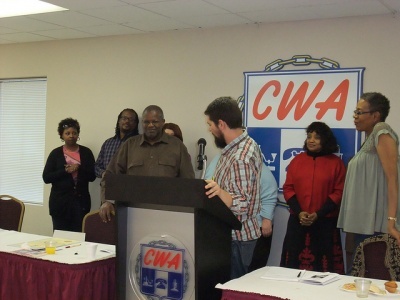 Jim Wilkerson, district organizer of the Kansas-Missouri CPUSA and himself a CBTU activist, hailed the team mobilized by the Party and YCL. 'The Party and YCL are rising to the occasion, coalescing with other progressive forces to defend democracy and defeat Bush in November,' he said. Here is a Photo of me, (from left) Jim Wilkerson, Joan Suarez, Nafisa Kabir, David Bacon, Zenobia Thompson and Quincy Boyd at the MO/KS PWW 2007 'Working Class Media & Demo9cracy' forum. This page was last modified on 1 October 2018, at 13:14.